Star Wars: The Last Jedi will introduce us to a new type of warrior in the army of the First Order, the elite Praetorian Guards. As part of their continuing The Last Jedi coverage, Entertainment Weekly has given fans their first (official) look at the warriors that are described as Snoke's "bodyguards" by writer/director Rian Johnson. 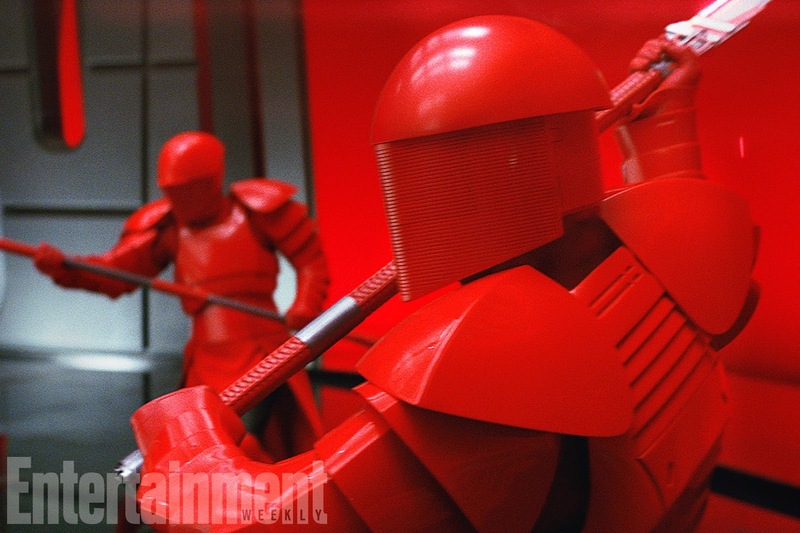 Johnson spoke with EW's Anthony Breznican about the Praetorian Guards' inspiration and role in the film. "The Emperor’s guards were very formal, and you always got the sense that they could fight, but they didn’t. They looked like they were more ceremonial, and you never really saw them in action. The Praetorians, my brief to [costume designer] Michael Kaplan was that those guys have to be more like samurai. They have to be built to move, and you have to believe that they could step forward and engage if they have to. They have to seem dangerous." "Similar to Rey’s parentage, Snoke is here to serve a function in the story. And a story is not a Wikipedia page. For example, in the original trilogy, we didn’t know anything about the Emperor except what Luke knew about him, that he’s the evil guy behind Vader. Then in the prequels, you knew everything about Palpatine because his rise to power was the story." "I’d be sitting at the monitor just with my eyes as big as dinner plates. It’s one of those performances where after every line, I’d look over at whoever’s standing next to me with an expression on my face like, ‘Oh, my God, we just got that." 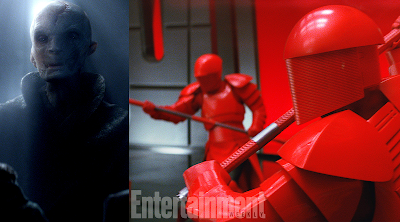 You can read the entire feature on Snoke and his elite Praetorian guards here. Exciting. Royal Guards were always a bit mysterious. I fear they took the samurai brief a little too literally but will wait to see them on the big screen.